Thread in 'Discussion' started by johnberhenry, 22 Apr 2008. Yet another clone of the popular Russian block game. This one allows two players and has tighter play control than most Tetris brand games. Version 0.30 introduces true lock delay, wall kick, and 4-state rotation. I don't understand the purpose of this post. Basically, you download a NES emulator such as Nintendulator, Nestopia, or FCE Ultra; then you download the game and load it in the emulator. I believe we already know about this. No hold. No ghost. Therefore, my cousin doesn't find testing it with me enjoyable; he always wants to go back to the Wii and Tetris Party, or perhaps turn on my PS2 and play In the Groove or Amplitude or We ? Katamari. Heck, he actually likes the so-called steaming pile of tech demo known as FantaVision. There aren't enough background colors. There are four palettes of three background colors and four palettes of three sprite colors. We already have one background palette for gray stuff (the fields and score displays), one for player 1's frame, and one for player 2's frame. The sprite palettes are already taken for player 1 and player 2's falling piece and next piece. This leaves exactly one palette of three colors for everything else. There aren't enough buttons on the NES controller. B and A are already taken for rotation, Start is taken for pause, and Select is quite a reach. Or should I map hold to B+A like I did in TOD for GBA and then just disable IRS from hold? Video memory bandwidth on the NES is limited. The game already pushes the limit of that to fully update both players' fields at 30 fps after line clears. There can only be 8 sprites on a scanline before they start dropping out, which is why some NES games flickered like hell. Each sprite is 8x8 pixels, the size of one block. Imagine what would happen if player 1 and player 2 are trying to lay I pieces at the same height. I already had to make changes to the previews to get them to flicker less when the falling piece overlapped them in 2-player mode. And there's a third, mysterious problem: flicker in the next piece that only shows up when I run it on an NES, not even the most accurate emulators. It also only shows up if pieces are falling, not landed. But then the average person on nesdev.com thinks floor kick is a bug. From what I can tell, he's describing not just the floorkick, but infinite spin as being a bug, and I agree. it seems like the existence of infinite spin in some games was intentional. it exists in TDS marathon but not in TDS multiplayer. but i DID find a real bug. BUG: after a hard drop, you can still rotate or move for a very small amount of time. Hard drop shoudl lock instantly, and it doesn't. interesting. is there manual locking of any kind? it's clearly INTENDED to lock. but for maybe 1/8th of a second or so, you can still do stuff with it. It's a firm drop with reduced lock delay. It's supposed to be a compromise between firm drop and hard drop, allowing quick Zangi-moves without slowing the player down too much (The New Tetris) or requiring Up-Down presses that are difficult with the controller packed in with the NES console (TGM, TAP, Ti Classic). If the behavior is too annoying, I can change it. is there manual locking of any kind? Down or Up when a piece has already landed will lock it, as in TDS and Lockjaw. Well it caused quite a few misdrops until i figured out what was going on. it still sounds faster than soft-drop-only, as seen in NES tetris and most older games. IRS if you hold B or A during line clear. Blocks of the falling piece that are entirely above the field aren't drawn, to reduce sprite dropout in the preview. Falling piece is drawn behind the background and preview. Together with the previous change, this should fully eliminate dropout glitches, though it increases flicker on the PowerPak. Plays the "thud" after line clears only once for each run of consecutive cleared lines. A 4-line clear gives one thud (not four), and only a hurdle clear gives two. Rotation system allows only one floor kick per piece. Infinite spin is no longer possible. 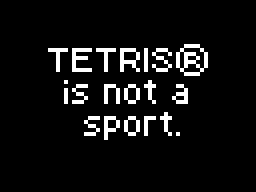 Tetramino 0.33 is on my NES page now. Works around a defect in the NES PPU's memory controller that was causing flicker. Thanks to blargg for characterizing this newly discovered quirk of the NES hardware. Sped up background map decompression by about 3 cycles per compressed byte (thanks blargg). Corrected shape of red piece in how to play and mentioned what Up on the Control Pad does. Randomizer doesn't make the same piece twice in a row. Processes rotation before sideways movement, not after. Draws a faded "ghost" piece where the falling piece would land if allowed to drop, to help the player line up the piece. New sound effects system similar to that of Lockjaw for DS. Speed curve approximates "Exponential" from Lockjaw, all the way up to 20G. Now play after 200 lines is a challenge again. Build uses fewer loose files; more of them are in folders. Forgive me for not working on Lockjaw more, but when I bought a PowerPak, I suddenly felt a lot more motivated to code for the NES than I was when emulators were my only way of testing. The "no duplicate pieces" thing made the game a lot easier. I think the t.pal file is corrupt; NESten complained about it, and FCEUX gave the game some very... interesting colors upon using it. Or, am I not supposed to use that pallete for Tetramino?